The D-Opto sensor – which measures temperature, dissolved oxygen saturation and dissolved oxygen content in liquids – is an indispensable tool for environmental monitoring and research. 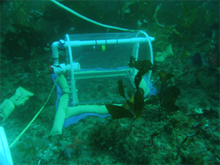 Pictured is an example of a productivity chamber used in the Santa Barbara Coastal Long Term Ecological Research (SBCLTER Programme).Water is circulated through the closed system by the pump mounted on the side. The two ends are made of rigid Plexiglas, and the domed wall is flexible Teflon sheeting (Tefzel), to transmit wave energy (which also circulated water around the algae) inside the chamber. The edges are sealed to the substrate by a weighted plastic skirt. Bio-fouling control: Copper guard around sensor window. Optional shutter system. In contrast to conventional dissolved oxygen instruments, the D-Opto sensing element utilises fluorescence to measure dissolved oxygen. The basic principle involves subjecting a fluorescing compound to a fixed wavelength of light. When the light source is removed, the compound emits a fluorescence, the intensity of which is dependent on the oxygen levels present in the surrounding water. Ruthenium is used as the fluorescing compound in the D-Opto. An extremely stable electronic circuit is used to excite the ruthenium, and then measure the intensity of fluorescence. As a result, the D-Opto should provide accurate dissolved oxygen measurements over long periods of time without the need for re-calibration. Unlike conventional polarographic dissolved oxygen sensors, the optical method does not consume oxygen. Consequently the measurement of dissolved oxygen by the D-Opto is unaffected by water flow. Similarly the D-Opto does not utilise a membrane or any other consumables, thus minimising the servicing requirements. Sensor, bio-foul ring, interface board, software, and communications cable. *Also available with SDI-12 output.